This name uses Eastern Slavic naming customs; the patronymic is Valeryevich and the family name is Kovalchuk. Ilya Valeryevich Kovalchuk (Russian: Илья Валерьевич Ковальчук; born April 15, 1983) is a Russian professional ice hockey player currently playing for the Los Angeles Kings of the National Hockey League (NHL). He has previously played for the Atlanta Thrashers and New Jersey Devils in the NHL, and Ak Bars Kazan, Khimik Moscow Oblast, and SKA Saint Petersburg in the Russian Superleague (RSL) and Kontinental Hockey League (KHL). Kovalchuk was born in Kalinin (now Tver), a city roughly 180 kilometres northwest of Moscow, the second child and first son of Valeri and Lyubov. Born big, he was named in honour of Ilya Muromets, a legendary figure from Kievan Rus'. Valeri played basketball in Tver; after his career ended, he turned to coaching and was the head of the sport's school at the Spartak Olympic reserve in the city from 1980 until 1998, while Lyubov was the head of the #2 polyclinic of the #7 Tver city hospital. Valeri would later write a book detailing Kovalchuk's development as a hockey player, titled "From Tver to Atlanta" (Russian: «От Твери до Атланты») and published in 2004; he died in 2005 due to heart disease. Kovalchuk's sister, Arina, is seven years older than him. 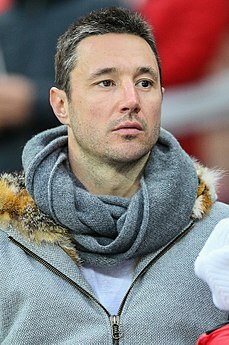 At age seven, Kovalchuk was invited to join the Spartak Moscow youth school, which he went to every weekend, taking the train with his father. Kovalchuk met his future wife, Nicole Andrazajtis, in 2002 after being introduced by mutual friends. Nicole was a well known singer in Russia at the time and was part of the group Mirage. They married in 2008 at Church of Dormition in Russia. Together they have four children: daughters Karolina and Eva, born in 2006 and 2015; and sons Philipp and Artem, born in 2009 and 2010, respectively. As a youth, Kovalchuk played in the 1997 Quebec International Pee-Wee Hockey Tournament with Spartak Moscow. He later played for Vysshaya Liga club Spartak Moscow for two seasons before entering the NHL. Drafted by the Thrashers first overall in the 2001 NHL Entry Draft, he became the first Russian to be drafted first overall in the NHL's history. In club-level competition, Kovalchuk wore the number 17 as a tribute to Valeri Kharlamov, a Soviet superstar in the 1970s. Entering his NHL rookie season in 2001–02, Kovalchuk scored 29 goals and 51 points despite missing 17 games with a season-ending shoulder injury. He finished second in voting to teammate Dany Heatley for the Calder Memorial Trophy as NHL rookie of the year. Both were named to the NHL All-Rookie Team. After improving to 38 goals and 67 points in his second season, Kovalchuk scored 41 goals in 2003–04, making him a co-winner of the Maurice "Rocket" Richard Trophy after tying for the NHL lead in goals with Jarome Iginla of the Calgary Flames and Rick Nash of the Columbus Blue Jackets. He also added 46 assists for 87 points, tying him with Joe Sakic of the Colorado Avalanche for second in the NHL that season, behind Martin St. Louis. Kovalchuk also participated in his first NHL All-Star Game in 2004. Due to the 2004–05 NHL lockout, Kovalchuk returned to Russia, playing for both Ak Bars Kazan and Khimik Moscow Oblast of the Russian Superleague (RSL). After the lockout, Kovalchuk and the Thrashers could not initially agree to a new contract, so he stayed in Russia, rejoining Khimik Moscow Oblast. He played 11 games for the team, recording 8 goals and 13 points before returning to the Thrashers and NHL after signing a five-year, $32 million contract. During the 2005–06 season, he scored 52 goals, tying him with rookie Alexander Ovechkin of the Washington Capitals for third in the NHL in scoring, behind Jonathan Cheechoo of the San Jose Sharks (56) and Jaromír Jágr of the New York Rangers (54). He also tied his career-high of 46 assists for a career-high 98 points, leading the Thrashers in team scoring for the second consecutive season, while finishing eighth overall in NHL scoring. He also became the first Thrashers player to score 50 goals in a season. In the 2006–07 season, Kovalchuk's point production dropped for the first time in his career. He finished with 42 goals and 34 assists for 76 points. During a game against the Nashville Predators on January 11, 2006, Predators head coach Barry Trotz accused Kovalchuk with "always plays with an illegal stick". Trotz had asked the referees to check Kovalchuk's stick following a Thrashers goal, but claimed Kovalchuk was able to switch his stick before the referees could check. Despite his drop in production on the season, Kovalchuk and the Thrashers qualified for the Stanley Cup playoffs for the first time in franchise history. Kovalchuk scored one goal and one assist in his NHL playoffs debut as the team lost in the opening round to the New York Rangers in four games. In 2007–08, Kovalchuk scored two consecutive hat-tricks in a loss to the Ottawa Senators and a win against the Tampa Bay Lightning on November 1 and 3, 2007, respectively. Later that season, on January 23, 2008, Kovalchuk was suspended for one game by the NHL for a hit from behind on New York Rangers defenceman Michal Rozsíval in a game a day prior. He finished with his second 52-goal season in three years, along with 35 assists for 87 points. With the departure of Bobby Holík to the New Jersey Devils in the 2008 off-season, the Thrashers' captaincy remained vacant for the first half of the 2008–09 season. Kovalchuk served as one of five alternate captains to start the season until the alternates collectively requested to general manager Don Waddell and head coach John Anderson for Kovalchuk to take over the captaincy. Soon thereafter, on January 11, 2009, Kovalchuk was named Holík's successor and the sixth team captain in Thrashers' history during the team's Casino Night charity event. The announcement came amidst speculation that the Thrashers were looking to trade Kovalchuk, as his contract was set to expire at the end of the following season. Kovalchuk completed his first season as team captain with 43 goals for his fifth consecutive 40-goal season and 91 points. Near the beginning of the 2009–10 season, Kovalchuk scored the 300th and 301st goal of his NHL career in a 4–2 win during the St. Louis Blues' home opener on October 8, 2009. He was leading the NHL in goals several weeks into the season when he suffered a broken foot after blocking shot in a game against the San Jose Sharks on October 24. In the final year of his contract, Kovalchuk and the Thrashers could not come to an agreement on an extension. Thrashers general manager Don Waddell reportedly offered 12-year, $101 million and seven-year, $70 million contracts, both of which Kovalchuk turned down. Rather than potentially losing him to unrestricted free agency in the off-season, on February 4, 2010, Kovalchuk was traded to the New Jersey Devils. Atlanta received defenceman Johnny Oduya, rookie forward Niclas Bergfors, junior prospect Patrice Cormier and a first-round selection in the 2010 NHL Entry Draft in exchange for Kovalchuk and defenceman Anssi Salmela; the teams also traded second-round selections in the 2010 NHL Entry Draft. Kovalchuk recorded two assists the following day in his Devils' debut, a 4–3 win over the Toronto Maple Leafs on February 5. Kovalchuk eventually ended the season with 41 goals along with 44 assists, for 85 points split between Atlanta and New Jersey. On February 10, 2011, Kovalchuk scored the game-winning goal in a game over the Maple Leafs to give Jacques Lemaire the 600th win of his coaching career. Kovalchuk became an unrestricted free agent on July 1, 2010. On July 19, after receiving offers from other teams, Kovalchuk agreed to a 17-year, $102 million deal to remain with the Devils. The length of the deal broke the record for the longest contract in NHL history. However, the contract was blocked by the NHL the next day on the ground it circumvented the NHL salary cap. Arbitrator Richard Bloch heard the National Hockey League Players' Association (NHLPA)'s appeal and ultimately nullified the deal. Another contract was submitted to the NHL. During the early morning hours of September 4, 2010, the NHL approved the contract along with a new agreement with the NHLPA. The contract was for 15-years and worth $100 million deal. Consequently, the NHL penalized the Devils for trying to circumvent the NHL salary cap with Kovalchuk's original contract. As a result, the Devils surrendered $3 million, a third-round draft choice in the 2011 NHL Entry Draft and one future first-round draft pick within the next four seasons. The Devils decided to use their first-round draft pick in the 2011 and 2012 NHL Entry Drafts and were to surrender their first-round pick in 2014. However, on March 6, 2014, the NHL announced it would forgive part of the $3 million fine and grant the Devils the 30th pick in the first round of the 2014 NHL Entry Draft. Kovalchuk recorded a Gordie Howe hat trick – a goal, an assist, and a fight – on February 4, 2012, the two-year anniversary of his trade to the Devils, against the Philadelphia Flyers. This was the first such hat trick ever recorded by Kovalchuk and second in the Devils' franchise, following Adam Henrique the month before. Kovalchuk assisted on two goals by teammate Kurtis Foster, scored a short-handed goal, then fought Brayden Schenn after a scrum formed when Flyers forward Zac Rinaldo performed a slew-foot on Devils captain Zach Parise. Kovalchuk recorded his first scoring hat-trick as a member of the Devils on February 14, 2012, during a 4–1 victory in Buffalo against the Sabres. Kovalchuk ended the 2011–12 season with seven game-deciding shootout goals and 11 shootout goals in total, setting a new record in both categories. The NHL first introduced shootouts in 2005. Kovalchuk and the Devils won the 2011–12 Eastern Conference finals against the New York Rangers in six games, setting a Stanley Cup meeting with the Los Angeles Kings. Despite leading the 2012 playoffs in scoring through the first three rounds, Kovalchuk was playing with a herniated disc and was largely ineffective against the Kings, scoring just one point in the series, an empty-net goal in Game 4, as the Devils fell to the Kings in six games. As a result of the 2012–13 NHL lockout, Kovalchuk elected to sign a temporary contract with SKA Saint Petersburg of the Kontinental Hockey League (KHL) on September 18, 2012. Kovalchuk played in Russia until a labor agreement was reached between the NHLPA and the NHL in January, allowing the 2012–13 NHL season to start. Kovalchuk was named captain of SKA Saint Petersburg at his contract signing. In addition, Kovalchuk was the subject of criticism for not returning to the United States immediately after the lockout ended, instead electing to be one of two participating NHL players in the KHL All-Star Game (the other being Pavel Datsyuk). Kovalchuk served as the captain of the Western Conference and returned to the United States to the Devils' training camp immediately after. He finished the season with 31 points in 37 games for the Devils, and 42 points in 36 games for SKA. On July 11, 2013, Kovalchuk chose to retire from the NHL. Although Devils general manager Lou Lamoriello knew Kovalchuk had been considering retirement since before the 2012–13 shortened season, Kovalchuk's departure came as a surprise to the public. Upon leaving, Kovalchuk had $77 million and 12 years remaining on his contract. Kovalchuk claimed he desired to return home to Russia along with his family, though it is speculated that money had quite an influence as well, due to the higher total salary Kovalchuk will receive in Russia via the far lower Russian tax rate compared to the U.S. However, with the crash of the Russian ruble in December 2014, that no longer remains the case, and Kovalchuk's tax-effected NHL salary would be greater than his KHL proceeds. Kovalchuk tallied 417 goals and 816 points in 816 games in total in the NHL. On July 15, 2013, Kovalchuk signed a four-year contract with SKA Saint Petersburg. The contract, signed less than a week after Kovalchuk's retirement from the NHL, is alleged to be comparable to his former contract with the Devils. He helped the team win the 2014–15 Gagarin Cup for the first time. He was chosen as the MVP of 2015 Gagarin Cup playoffs, but passed the award to Evgenii Dadonov. He won a second Gagarin Cup, again with SKA Saint Petersburg, in 2016–17. ^ a b c d Avdeyeva, Svetlana. ""Транмвай желания" Ильи Ковальчука ("Tramway of Desires" by Ilya Kovalchuk)" (in Russian). Karavan.Tver.ru. Retrieved 2017-11-15. ^ Danilov, Yuri (2010-10-17). "Мультимиллионер, отдавший долг России (Multimillionaire, in Russia's debt)" (in Russian). Hockey.Sport.ua. Retrieved 2017-11-15. ^ Sovetsky Sport (2005-03-19). "Валерий Ковальчук: Как мой сын стал звездой (Valeri Kovalchuk: How my son became a star)" (in Russian). Sovsport.ru. Retrieved 2017-11-15. ^ Sovetsky Sport (2005-07-20). "Умер отец Ильи Ковальчука (Ilya Kovalchuk's father died)" (in Russian). Sovsport.ru. Retrieved 2017-11-15. ^ a b c "NHLPA PLAYER BIO: Ilya Kovalchuk". Archived from the original on 2004-11-12. Retrieved 2006-09-13. ^ Larry Wigge (2001). "Few doubts surround top pick Kovalchuk – National Hockey League Draft, hockey player Ilya Kovalchuk". The Sporting News. Retrieved 2006-09-23. ^ Sedov, Alexander (2005-09-10). "Ковальчук стал самым дорогим хоккеистом "Атланты" (Kovalchuk became the most expensive Atlanta player)" (in Russian). Sport.ru. Retrieved 2017-11-15. ^ "Thrashers 4, Predators 3, SO". USA Today. 2006-04-18. Retrieved 2006-09-23. ^ "Kovalchuk suspended for hitting Rozsival from behind". NHL. 2008. Retrieved 2008-01-23. ^ a b c "Call him 'captain' Kovalchuk now". Atlanta Journal-Constitution. 2009-01-12. Retrieved 2009-10-29. ^ "Atlanta Thrashers at St Louis Blues Game Recap". Nhl.com. 2009-10-08. Retrieved 2012-04-10. ^ "Thrashers lose Kovalchuk, second straight game". Atlanta Journal-Constitution. 2009-10-24. Retrieved 2009-10-29. ^ Diamos, Jason (2005-08-24). "Thrashers trade Heatley to Senators for Hossa". New York Times. Retrieved 2008-09-29. ^ TSN (2010-02-04). "Thrashers ship Kovalchuk to Devils for players, 1st Rounder". The Sports Network. Archived from the original on 2010-02-05. Retrieved 2010-02-04. ^ "Devils storm back late to down Leafs in Kovalchuk's debut". The Sports Network. 2010-02-05. Archived from the original on 2010-02-08. Retrieved 2010-02-05. ^ "Lemaire reaches 600 wins in Devils edge Leafs". CNN. ^ "Kovalchuk gets 17-year deal from Devils". ESPN. 2010-07-19. Retrieved 2010-07-19. ^ "Reports: Arbitrator rules in NHL's favor". National Hockey League. 2010-08-09. Retrieved 2010-08-09. ^ "Reports: Kovy deal registered as NHL, NHLPA reach settlement". 2010-09-04. Retrieved 2010-09-04. ^ "New Jersey Devils' penalty for Kovalchuk contract modified". 2014-03-06. Retrieved 2014-08-04. ^ "Ilya Kovalchuk had a Gordie Howe hat trick". Prohockeytalk.nbcsports.com. Retrieved 2012-04-10. ^ Kevin Hoffman/US Presswire. "Ilya Kovalchuk surprised to get pass for first hat trick with Devils". NJ.com. Retrieved 2012-04-10. ^ "A final statistical look at 2011–12 regular season". NHL.com. 2010-04-02. Retrieved 2012-04-10. ^ "Kovalchuk going to SKA St. Petersburg". ESPN. Retrieved 2012-12-14. ^ Kimelman, Adam (July 11, 2013). "Devils' Ilya Kovalchuk announces retirement from NHL". NHL.com. Retrieved September 18, 2018. ^ Chere, Rich (July 11, 2013). "Ilya Kovalchuk leaves Devils in shock after retiring from NHL". NJ.com. Retrieved September 18, 2018. ^ Gretz, Adam (2013). Ilya Kovalchuk announces retirement "CBSsports – Eyeon hockey"
^ Allen, Kevin (2013-07-11). "Ilya Kovalchuk says he's retiring from NHL". USA Today. ^ "Ilya Kovalchuk is with SKA!". July 15, 2013. Archived from the original on July 26, 2013. ^ Klein, Jeff Z. (July 15, 2013). "Kovalchuk Signs With SKA St. Petersburg of K.H.L." The New York Times. ^ "Cap Comparables: Ilya Kovalchuk returns to NHL on big-ticket contract". Sportsnet.ca. June 23, 2018. Retrieved July 2, 2018. ^ "Ilya Kovalchuk Signs 3-Year, $18.75 Million Contract with LA Kings". NHL.com. July 1, 2018. Retrieved July 2, 2018. ^ "Kovalchuk named MVP". IIHF. 2009-08-24. Archived from the original on 2009-05-13. Retrieved 2009-05-10. This page is based on the Wikipedia article Ilya Kovalchuk; it is used under the Creative Commons Attribution-ShareAlike 3.0 Unported License (CC-BY-SA). You may redistribute it, verbatim or modified, providing that you comply with the terms of the CC-BY-SA.